LAKE SUCCESS, N.Y., July 26, 2011 – Canon U.S.A., Inc., a leader in digital imaging, today announced the introduction of two new photo printers, the PIXMA MG5320 Wireless Photo All-In-One1 and the PIXMA iP4920 Photo Inkjet Printer models. Developed to enhance the overall user experience, both printers feature significant upgrades to Easy-PhotoPrint EX and Full HD Movie Print2 software. "One of the most important attributes consumers look for in a printer product is high-quality output and versatility," said Yuichi Ishizuka, executive vice president and general manager, Imaging Technology and Communications Group, Canon U.S.A. "These new PIXMA printer models will undoubtedly meet this demand while also allowing consumers to show their creative side as well." An incentive for those who have registered with the CANON iMAGE GATEWAY service or Picasa Web Albums is PIXMA Cloud Link, which provides the ability to print, directly through the PIXMA MG5320 printer without the use of a computer, photos from photo albums stored in those services3. Users of PIXMA Cloud Link will also have access to exclusive templates including stationary, envelopes, memos, calendars and many others. In addition, the PIXMA MG5320 printer is 802.11n Wi-Fi certified allowing for a fast network transfer rate. Wireless networks can be set up with the press of one button when using a Wi-Fi Protected Setup (WPS). Canon U.S.A. offers its award-winning service and support online for all of its consumers looking to set up any of the new Wi-Fi products at, www.usa.canon.com/wirelesshelp. Here customers have access to manuals and video tutorials to assist in setting up a Wi-Fi device. The Canon EPP mobile app, for use with compatible Android and Apple smartphones and tablets, will be upgraded in August to have documents scanned on the printer to then be sent directly to a compatible device. Users can also print pdfs of documents that were created with the App directly from compatible devices whereas in the past only photos were able to be printed. Since its inception, the Canon Easy-PhotoPrint EX software has provided users with an easy way to get the most out of prints by creating albums, calendars and stickers from almost any image. Now with the latest version, users can bring creativity to a whole new level with the addition of Fun Filter Effects similar to scene modes found on the latest Canon PowerShot Digital Cameras. Images can be customized with Fish-Eye, Miniature and Toy Camera effects to make them even more memorable while being a conversation piece at the same time. In addition, there is an option to change the focus of the image to have it appear softer and the ability to blur specific aspects of the background, an effect previously only captured with a SLR. Adding to the versatility of these Canon PIXMA printers is the ability to print directly on to CDs, DVDs, and Blue-rays allowing users to personalize media in a creative way while creating fun photo projects at the same time. Full HD Movie Print, which is available on both new PIXMA printers, has been enhanced to produce clearer images of frames from videos captured on compatible HD Canon EOS and PowerShot Digital Cameras. This technology allows users to tell the story of a video captured in the park or at a memorable event frame by frame in a more unique way than before. One new aspect is the ability to merge multiple images into one final shot so users will be able to capture nearly every portion of a golfer's swing or a baby's first steps. In addition, a new layout feature allows printing up to 72 individual images on one sheet of paper. For the consumer interested in a high-quality multifunction printer which is easy to use and affordable, the Canon PIXMA MG5320 Wireless Photo All-In-One Printer should be at the top of the list. This printer features five individual ink tanks which is part of the ChromaLife100 + ink system4 and help to produce a 4" x 6" borderless photo in approximately 20 seconds5. In addition the printer has a maximum color resolution of 9600 x 2400 dpi6. This new PIXMA office machine will deliver output at approximately 12.5 ipm for black-and-white documents6 and approximately 9.3 ipm for color7. The Advanced Media Handling options such as Auto Duplex printing which helps conserve your paper supply and a two-way paper feed that can help reduce the amount of time it takes to complete a project. The LCD has been repositioned toward the middle of the printer helping to streamline the navigation process and achieving a more sleek and stylish design. The size of the LCD screen has also been increased to 3.0-inches for easy viewing and navigation through menus. The Canon PIXMA MG5320 Wireless Photo All-In-One Printer will have an estimated selling price of $149.99. 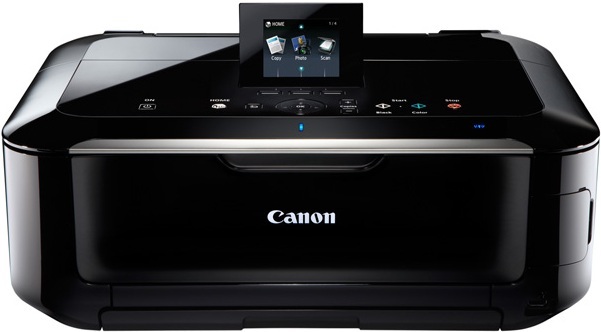 The Canon PIXMA iP4920 Inkjet Photo Printer is an ideal choice for the consumer interested in an affordable, single function printer producing superb quality. Utilizing the ChromaLife100 + ink system4 with five individual ink tanks, the printer is capable of producing a 4" x 6" borderless photo in approximately 20 seconds5. This new PIXMA machine delivers output at approximately 12.5 ipm for black-and-white documents and approximately 9.3 ipm for color7. In addition, the printer has a maximum color resolution 9600 x 2400 dpi6 and is capable of Auto Duplex printing to help conserve paper. The overall functionality of the PIXMA iP4920 printer helps make this printer a perfect addition for any home or office. The Canon PIXMA iP4920 Photo Printer will have an estimated selling price of $99.99.